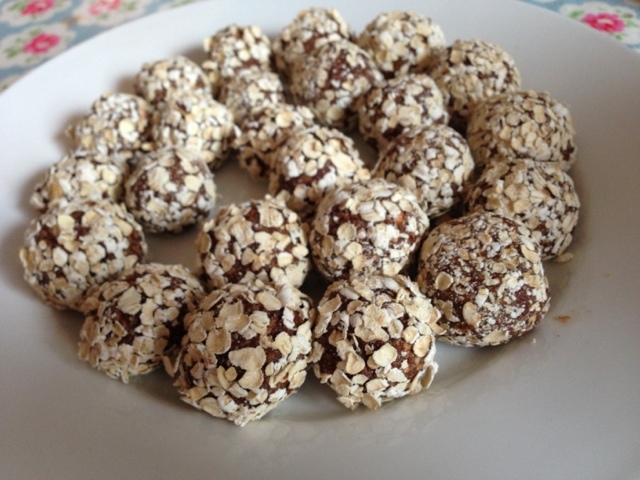 These bliss balls are quite rich but perfect for when you need a chocolate hit. I tend to eat them in the morning with my breakfast smoothie. Out of all the the things I have tried to make whilst experimenting with vegan baking these are the best. I think it's because they are not trying to imitate something so you don't have any preconceived ideas about what they should taste like. I really like them and I hope you do to! 1. Remove the caps and pits from the dates and tear into smaller segments. Add the dates, 1/4 cup of oats and the maple syrup to the food processor blend on a high speed until smooth. It may form a ball but just squish the ball down and carry on blending. 2. You can use any nuts you like for these balls i used cashews due to the fact they don't have an overpowering flavour but feel free to experiment and use whatever you have in your cupboards. Add the nuts and the coco powder to the food processor and blend until well combined and the mixture is relatively smooth, you will still have small pieces of nuts. Taste the mixture and see if you want to add more coco powder to make the mixture more chocolatey or maple syrup to make it sweeter. 3. Now take a tsp of the mixture and roll it into balls in your hands and then roll in the remaining oats to coat them. Continue doing this until there is no mixture left. 4. Put in an airtight container they balls should dry out a little bit and get firmer.